To see how we can help you today, please read on below or click here for our Course Information - following is a glimpse of our backgrounds - we'd love to share our experiences with you. 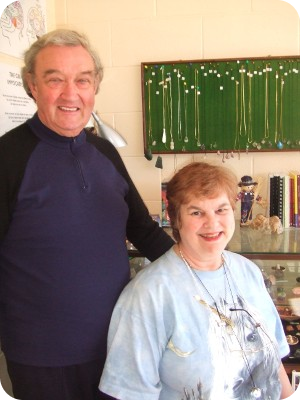 Bob and Jan met in N.Z., they are partners in The Healing Energy Light Centre, They are Presidents of the NFSH (N.Z.) Inc., an organisation they founded and formed in N.Z. Jan originates from Vancouver, Canada and Bob from the East End of London, so they have already linked Canada, UK. and N.Z. Both are N.Z. Citizens and both have many talents which, brought together, add to a formidable array of abilities which they wish to share with other people. Bob is clairvoyant and has been consistently commended on his very special gift. Jan is an exceptional healer with a long list of successes. They travel throughout the North Island giving "services" at Spiritualist Churches and have been very well received for their different and very enjoyable style of presentation. Last, but not least, Jan and Bob are the authors of an amazing book "Awaken To The Light" which they have published themselves. This book has been accepted as "recommended reading" by the NFSH U.K. and is distributed in the U.K. by a major book company. Both Bob and Jan are Full Healer members of the NFSH U.K. and both are fully licensed as "International Tutors" of this organisation. This allows them to formally present the NFSH Basic Healing Development Courses 1 - 4 and issue internationally recognised certificates. Both are fully experienced in Therapeutic Massage. Bob and Jan are President and Vice President of the NFSH (N.Z.) being Founder Members Bob is also President of IPANZ - The Information Providers Association of N.Z. (0900 Association). Both are full Members of The Natural Health Practitioners of N.Z. under "Natural Therapies". Bob is also a member of the Natural Therapies Presidential Board. Both Bob and Jan are now Bishops in the Internationally Renowned and Recognised Madonna Ministry. They were Consecrated as Bishops in a ceremony in Australia in September 2003. They have also been accepted as Reverent Ministers in "The Eagle Lodge all Faiths Church". This Ordination also took place in Australia in September 2003. Click here to see the range of our Courses, Services & Therapies. Click Here to find out who the N.F.S.H is. And to understand what is spiritual Healing? Do you feel drained of energy? Do you find it hard to concentrate? Do you get frequent headaches? Do you feel spaced out at times? Do you hear voices in your head? Do you see unusual things? Do you pick up and absorb other peoples pain and emotions? This book is a "Rescue Remedy"
for all the above listed problems and more. aware and the experienced Light Worker alike." The Universal/Cosmic Energy - what it is, how it affects us, how to control it and why we need this control. The Protection - what they are, how to do them and why they are necessary. A basic introduction to Meditation - how to do it safely (includes information for Group work and Group Leadership.). A basic introduction to Spiritual Healing - how to attune to and utilise the Universal/Cosmic healing energy to help yourself and others (based on NFSH N.Z. & U.K. principles). A basic introduction to Spiritual Awareness - Clairvoyance and 'Opening to Channel'. © 2006 — 2019 The Healing Energy Light Centre. All rights reserved.